Isle of Man with its capital Douglas is located in Europe (Western Europe, island in the Irish Sea). It covers some 573 square kilometers (slightly more than three times the size of Washington, DC) with 88,815 citizens. 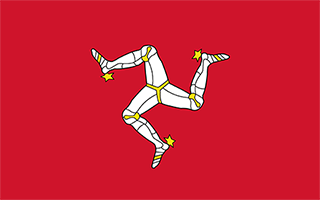 English and Manx are the common languages used in Isle of Man. Thiscountry has no land-based border with any other country. The Isle of Man is an island in the British Isles, located in the Irish Sea between the islands of Great Britain and Ireland. There are many hiking/walking trails and footpaths on the Isle of Man, the most significant being the Raad ny Foillan (The Way of the Gull) which is a 95-mile footpath around the Island. Other trails cross the Island in various locations. The Raad ny Foillan follows the coast for much of its route and is really quite a spectacular hike, well worth the time and effort while visiting the Island. The topography is hills in north and south bisected by central valley. The average density of population is about 155 per km². The climate in Isle of Man can be described as temperatecool summers and mild winters, overcast about a third of the time. Potential natural disasters are occasional high winds and rough seas. To reach someone Isle of Man dial +44-1624 prior to a number. The local cellular networks are operated on 900 MHz, 1800 MHz, 3G, 4G. Websites typically end with the top level domain ".im". If you want to bring electric appliances (e.g. battery chaarger), keep in min the local 230 V - 50 Hz (plugs: C, G). The sign for the locally used currency Pound is GPD. Red with the Three Legs of Man emblem (triskelion), in the center; the three legs are joined at the thigh and bent at the knee; in order to have the toes pointing clockwise on both sides of the flag, a two-sided emblem is used; the flag is based on the coat-of-arms of the last recognized Norse King of Mann, Magnus III (r. 1252-65); the triskelion has its roots in an early Celtic sun symbol.